Most of us receive many – maybe even hundreds of – emails a day. To break through the clutter of newsletters, notifications, sales and promotions, email marketers must be strategic with their email marketing campaigns. 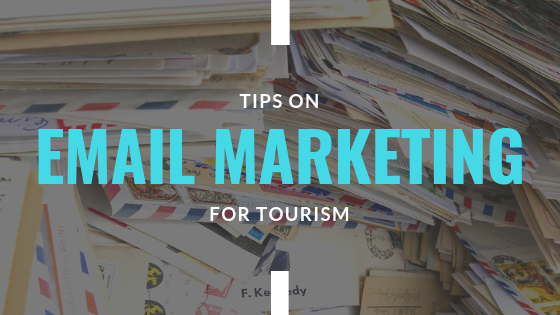 And when it comes to making a destination stand out, email marketing for tourism can follow many general marketing best practices. From creating an eye-catching layout to crafting a clever subject line, these tips and tricks will help promote your destination to interested readers. One of the most important pieces to email marketing is the mailing list. You need someone to send your newsletter to, after all! A mailing list is one of the most valuable marketing assets because it is direct contact with customers. There are several ways to ask your customers to sign up for your newsletter. Creating a form on your website is an easy way to gather email addresses while also gaining the appropriate permission to contact these individuals. I highly recommend asking individuals what topics they’re most interested in – food and beverage, outdoor activities, events and concerts, etc. This way you can send targeted information to those who would be most interested in it. 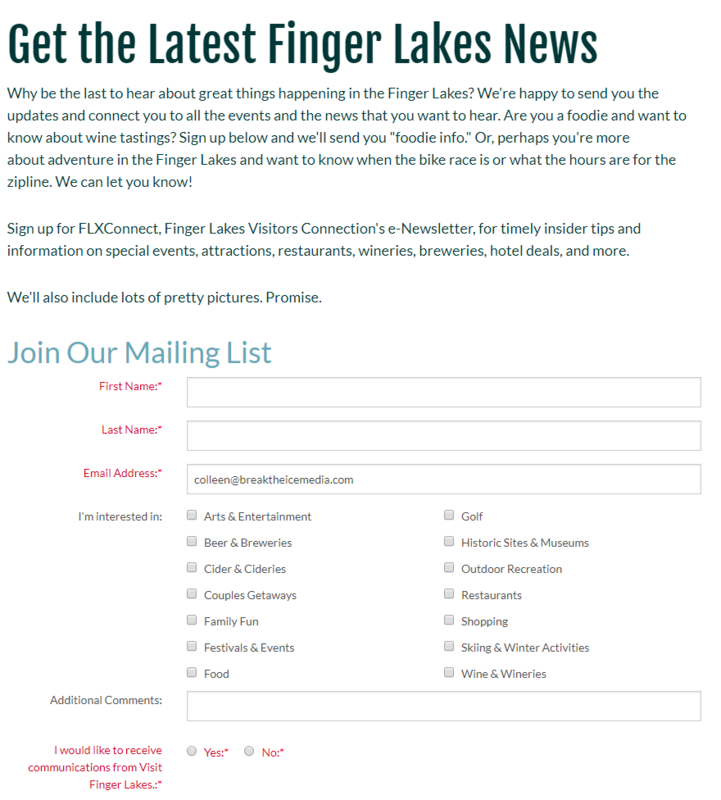 Finger Lakes Visitors Connection does a good job at this with their email subscription form. If you see customers in person, ask them to sign up for emails. Constant Contact even provides a text-to-join method for signing up that is easy to set up and comes with a designed printout. Any interaction with your target audience can and should include messaging around signing up for your newsletter. Share the link to your sign up form on your social media channels. You can even share newsletters to your social channels through most email marketing platforms. 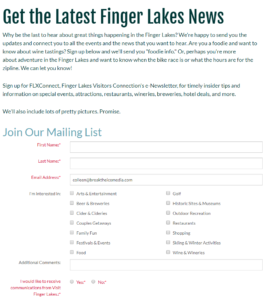 Have you already been collecting emails, but haven’t created a newsletter yet? That’s ok! You can still contact people who gave you their email address for up to two years, according to best practices. Consumers don’t have to be the only people on your email list. We consistently use email to stay top-of-mind with group planners and tour operators. A beautiful newsletter won’t increase visitation if no one opens it! In order to grab people’s attention, your subject line must be interesting and enticing. Test out various subject lines to see what works best with your readers. Play around with witty phrases, puns or even emojis (if that fits your brand) – but don’t get too carried away. Your subject line should still inform readers of what’s inside. Some email marketing platforms will even allow you to A/B test various subject lines and declare one the winner. No matter how you do it, pay attention to open rates to see which subject lines are attracting the most readers. Keep the body of your email short and sweet – break it down with small paragraphs or sections. Keep in mind, readers still want key details and information. For events, that means including date, time, location and any ticket information. For new hotels, include the location, guest room information and prices or promotions. 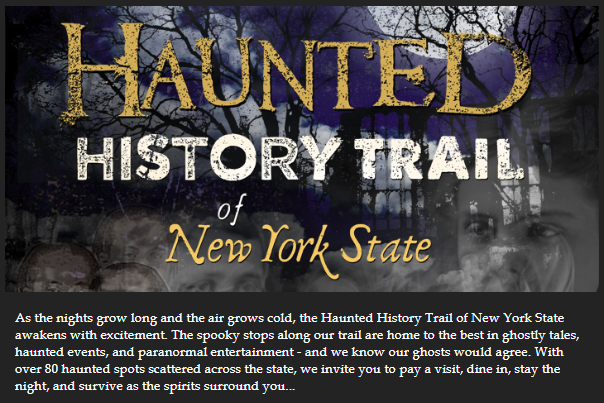 Effective email campaigns use creative copy to tell readers what to expect at your destination or event. This newsletter to Haunted History Trail’s subscribers begins with an engaging introduction paragraph that explains what one can encounter on a spooky tour across New York State. The most effective email campaigns are easy-to-read with plenty of white space. Adding photos to an email not only breaks up the text, it also helps readers picture visiting a destination or attending an event. Some emails start with a large, eye-catching photo at the top while others sprinkle images throughout the body. Some do both. Not sure where to begin? Email marketing platforms such as Constant Contact and MailChimp provide email templates that can be tailored to fit your destination’s or organization’s branding. 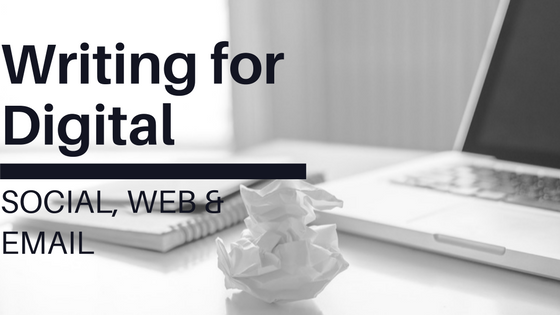 Include a call to action to guide your reader from the email to a website. Point readers to a blog on your website, a hotel’s booking page or ticket purchase page for an event. Make sure the call to action is straight-forward and easy to spot, such as a colorful button. Don’t be afraid to include multiple calls to action, such as in this newsletter from the Apple Tasting Tour. Take time to analyze site traffic and compare click through rates to see which calls to action get the most response. 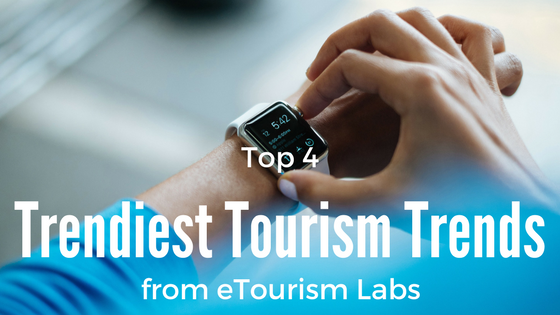 Writing for Digital: Social, Web & Email 5 Key Ingredients for Marketing Campaign Success Top 4 Trendiest Tourism Trends How to Market a Tourist Destination What the heck is a Facebook Pixel?